Many of you have probably heard the story of the Cailleach (hag or witch) of Loughcrew. 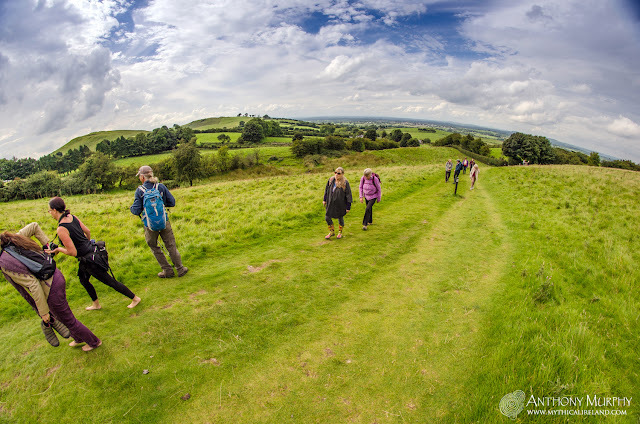 The hills of Loughcrew are scattered with the remnants of a vast cluster of megalithic monuments that are thought to be up to 5,500 years old. There are four hills - all containing monuments, mostly megalithic cairns and passage-tombs. These are known today as Carnbane West, Carrickbrack, Carnbane East and Patrickstown Hill. The hills, three of them at least, were collectively known in the 19th century as 'The Witches Hops', and in the 17th as 'the Calliagh Steppes'. 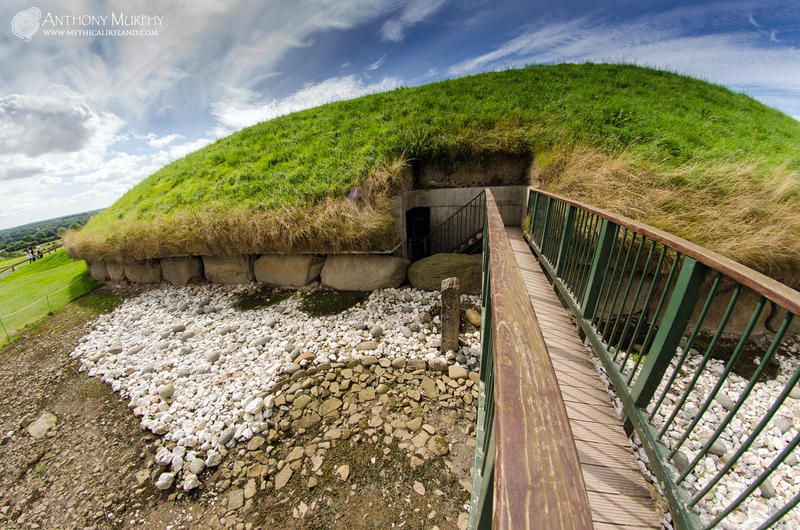 In some versions, Carrickbrack is omitted, and in the 15th century the remaining three were referred to as Trí Choiscéim na Caillighe, the three footsteps of the hag. Climbing Carnbane East to see Cairn T, with (in the left background) Carrickbrack and Carnbane West. The story about the Cailleach tells how she came from the north and she tried to jump from hill to hill, some say from the Carnbane (the westernmost hill) to Patrickstown (the easternmost), alighting on the other hills in between. If she could succeed in this magical feat she would obtain great power. She was carrying an apron full of stones. As she jumped from hill to hill, she dropped some stones from her apron, forming the cairns on each of the peaks. When she reached Patrickstown (which is undoubtedly a Christian name, and perhaps we might some day learn what its original name was) she fell and broke her neck. According to Jean McMann, in her lovely little book Loughcrew - The Cairns - A Guide, a pile of stones at the bottom of the eastern slope of Patrickstown Hill was known until recently as the cailleach's grave. In earlier times the hill we know today as Carnbane West was known just as the Carnbane (Carn Bán, the white cairn or the white heap of stones). The hill known today as Carnbane East was, it seems, known as Sliabh na Caillaigh, the mountain or hill of the hag/witch. Cairn T on Carnbane East, formerly known as the Hag's Carn and Sliabh na Caillaigh. 'This cailleach is famous in Irish folklore. Other storytellers have described her as a superhuman woman who could harvest a field faster than any man, a crone lamenting her youth, a banshee announcing a death, or a Christian nun. 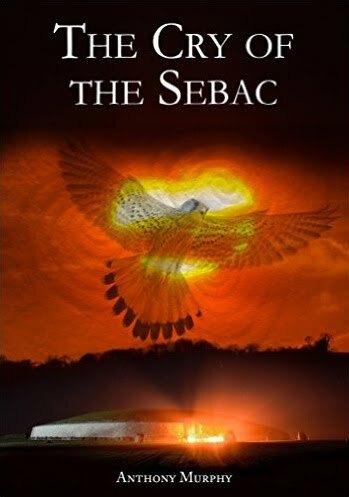 She is best known as Cailleach Bhéarra, but has been called by many other names, including not only Waura but Beri, Buí and Vera ... and may be a later version of the ancient pagan sovereignty queens whose consent was required for kings to rule. 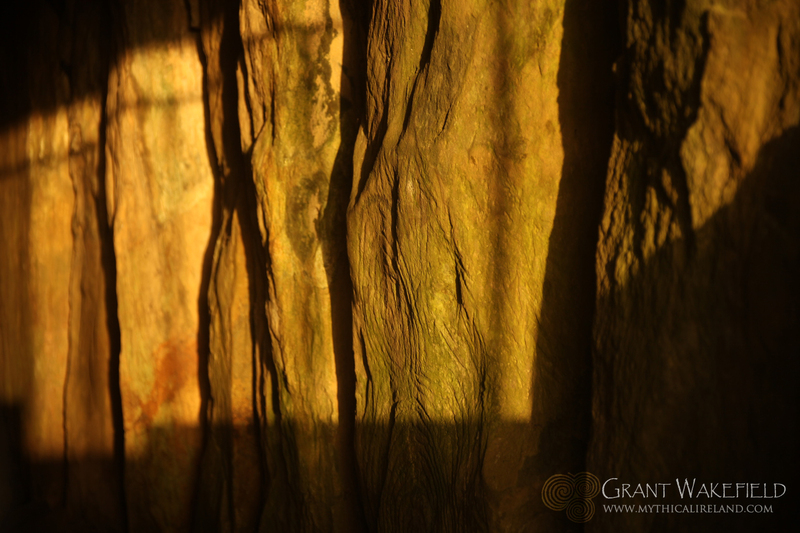 Some scholars think she represented wild nature, as a prehistoric earth goddess'. Michael Dames, writing in 'Ireland, A Sacred Journey', suggests that "the apron is the divine womb, translated into the language of dress". In this context, we can see the apron as a womb of creation, and perhaps, in the tradition of Marija Gimbutas, we can think of the cairns not so much as tombs, but more like wombs. 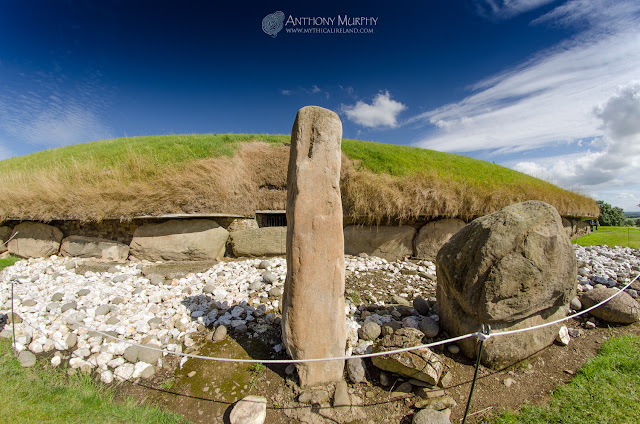 As a creation or origin myth, the story of the Cailleach of Loughcrew shares some similarities with another origin myth, that which tells about how the River Boyne was formed. In that story, Bóinn approaches Nechtain's Well, something which is forbidden for a woman. The well gushes forth into a fountain, carrying Bóinn along as it creates the River Boyne. Bóinn is mutilated by the waters - she loses an eye, and her arm and leg are broken. Eventually, she is washed out to sea, where she is drowned. Her lapdog, Dabilla, is transformed into the Rockabill islands. In both cases, a female deity is credited with an act of creation, and in both cases at the end of the act of creation the women are killed. Until 1980, little was known about any astronomical aspect of the Loughcrew cairns. 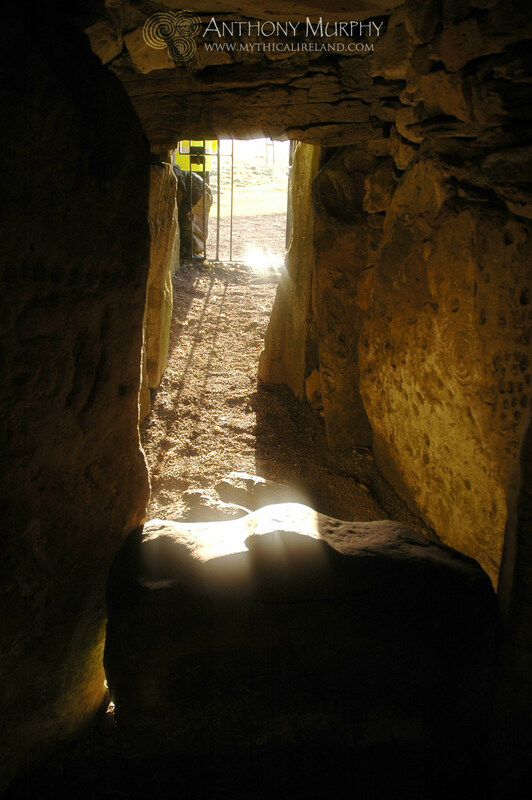 But in that year, Martin Brennan and Jack Roberts discovered the equinox alignment of Cairn T, during which the light of the rising sun on the equinoxes shines into Cairn T (photographed on left) and illuminates what Brennan described as "solar emblems" on the stone at the rear of the chamber. They also discovered that the chamber of Cairn L appeared to be aligned towards the November and February cross-quarter sunrises, and several other small cairns appeared to have alignments towards solar events. In some cases, the passage of a cairn is pointing towards another cairn. For instance, from the chamber of Cairn I on Carnbane West, the sun appears to rise over Cairn T on Carnbane East at the beginning of September. The imagery of a woman, or goddess, jumping from hill to hill is, I think, possibly symbolic of a system of alignments from various parts of the megalithic complex, focusing on sunrises and moonrises, and also sunsets and moonsets. 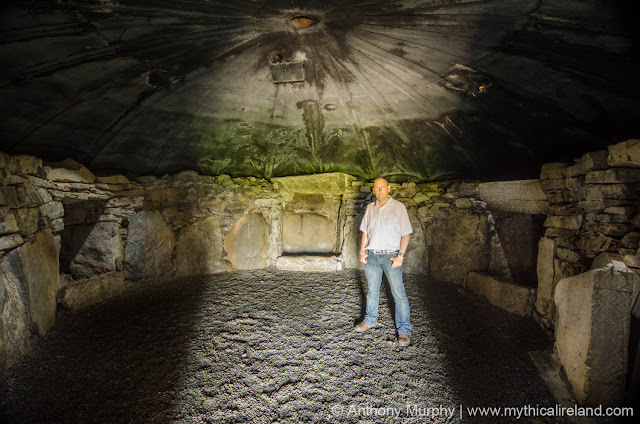 In the fullness of time, I think an even more comprehensive study of the alignments of Loughcrew will reveal an interest in the extreme lunar declinations, the minor and major standstills of the moon. At Dowth, for instance, my own studies of the alignments of its two known passageways indicates that the setting moon at both its major and minor southern setting positions might have been the primary, or even shared, targets of the southern and northern chambers, while the setting sun at winter solstice (southern chamber) and November/February cross-quarter days (northern chamber) were also targets. Perhaps the death of the Cailleach is allegorical, referring to the lunar extreme, and perhaps the "death" of one 18.6-year cycle and the beginning of the next one? The fact that she was said to have "come from the north is also interesting, because of the fact that the maximum northern rising and setting extremes of the standstill moon are located in the far northeast and northwest. 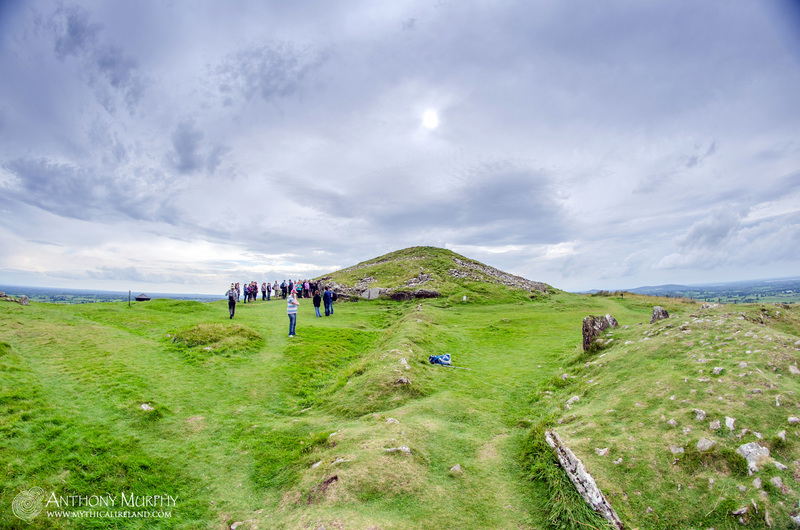 Until a more comprehensive study of possible lunar alignments at Loughcrew can be undertaken (and I must admit I would be very happy to be involved!) we can only reflect on the possibilities. We know that there are certainly solar alignments. We can't be sure that these alignments were an intended principal function of the monuments, but they constitute a fascinating and indeed almost mystical aspect of these ancient structures. To be lucky enough to have been witness to some of these alignments makes me feel an extraordinary connection with the builders. We cannot know how far back the story of the Cailleach of Loughcrew goes. Certainly as Jean McMann acknowledges, "People have probably been telling stories about the Loughcrew hills for more than five thousand years". Is it too bold a step, to wild a conjecture, to suggest that the story of the Witches Hops or the Cailleach's Steps is in fact some remnant of a very ancient myth, one which goes right back to the time when these cairns were constructed? 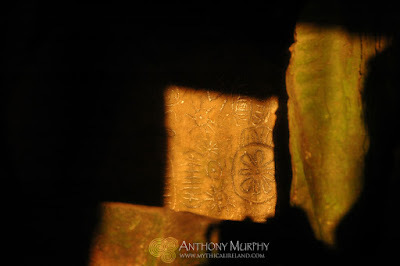 The illumination of solar emblems by equinox sunrise at Cairn T.
Of interest to our discussion about lunar standstills at Loughcrew is the fact that a society carefully observing and recording the moon's cycles would become aware of several things. The number of sidereal months (the time it takes the moon to complete a circuit of the sky, ie from a particular place on the Zodiac back to the same place again) and synodic months (a particular phase back to same phase, eg full moon back to full moon) does not fit neatly into a solar year. 12 synodic months is 11 days short of a 365-day solar year. In fact, the number of lunations only fits the solar year after 254 sideral months, or 235 sidereal months, which is equal to 19 years. This 19-year cycle is known today as the Metonic Cycle. See this page for a further discussion of the Metonics. Observers watching the Metonic Cycle would also naturally become aware of the rotation of the moon's nodes, and 18.6-year cycle during which the point where the moon's path crosses the sun's path (the moon's path is inclined to the ecliptic by 5.15 degrees, so its path intersects the sun's path at two points in the sky each month) appears to complete a full circuit of the sky. As this happens, the moon appears, at certain times during this 18.6-year cycle, to go through maximum and minimum extremes, which are observable by the moon's rising and setting places relative to the sun's solstice positions. When the moon's node is located exactly on the sun's solstice positions, there is a likelihood of eclipses occurring at the time of the solstices. Conversely, when the moon's nodes are located exactly on the sun's equinox points, not only is there a likelihood of eclipses at the time of equinox, but the moon's path will be at its maximum separation from the ecliptic at the sun's solstice positions. If the moon's declination is at that time within the range of the sun's path, we get what is termed the "minor standstill", while if its declination is outside of the sun's range, we get the major standstill. It is possible the builders of Cairn T at Loughcrew were not exclusively focused on the equinox sunrises, but also on observing the moon, and in particular at those times when its node was crossing the ecliptic at the sun's equinox points. If this is the case, as we can merely speculate, then we can envisage observers within the rear recess of Cairn T watching for the rising moon at such times. The natural extension of this argument is that if the moon is visible through the aperture of Cairn T and is in the same position in the sky as the equinox sun*, then seven days later (i.e. one-quarter of a circuit around the sky), the moon will be at its major standstill rising position (provided it is on its ascending node when visible within Cairn T) or at its minor standstill rising position if it is on a descending node. In other words, the Hag's Cairn might have been used to indicate the times of the extremes of the moon, when an 18.6-year cycle was ending (the death of the hag?) and a new one was beginning. 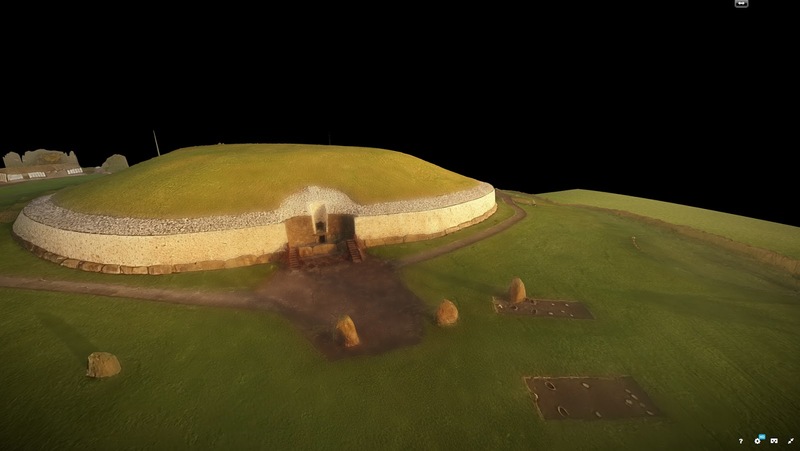 This fantastic model, created by Seán Doran and shared on Sketchfab, is based on images of the famous Stone Age monument that were taken from a drone by Matthew Kelly. The model is easy to navigate. Use your mouse wheel to zoom in and out. Left-click and drag to move around the model. Right-click and drag to move the centre of the model. 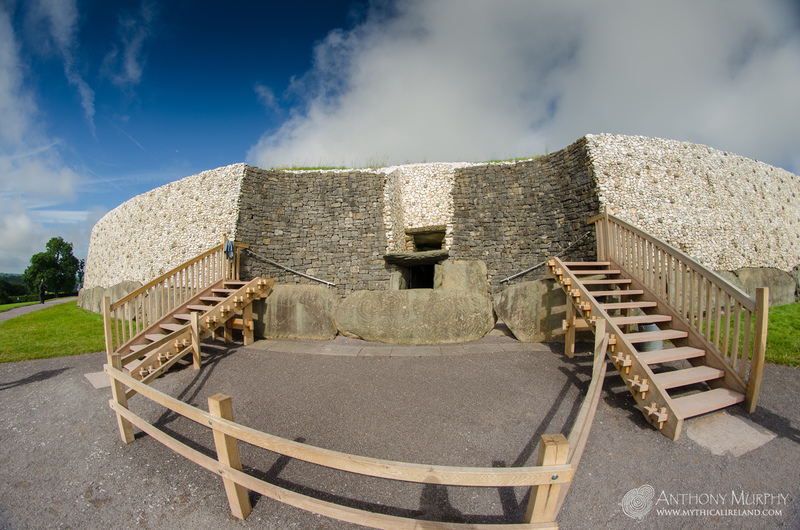 Enjoy this opportunity to see Newgrange up close, without having to make the journey half way around the world! During the course of the hour, we spoke about many things, not least Mythical Ireland, my books, the role of music, photography and newspapers. I hope you enjoy it. Mythical Ireland's Anthony Murphy in the ancient megalithic chamber of Fourknocks.